Completion. Satisfaction. Sense of achievement. Many long distance walks provide these feelings. When you walk from one place with a destination in mind, then getting there and revelling in that achievement is a big part of the experience. 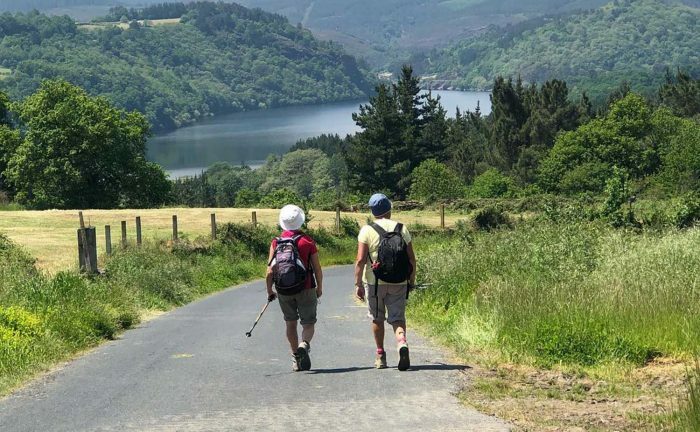 If you want to have these feelings along with a bunch of strangers, many of whom are now great friends, then there is no walk in the world like the Camino Frances Final Stage – Sarria to Santiago. Where: As the name suggests, the Final Stage of the Camino Frances is the last section of a much longer route that crosses the north of Spain. Many of you will know all about the Camino de Santiago, but if not, it is well worth checking out this video. This part of the route is in Galicia, the north-west corner of Spain. 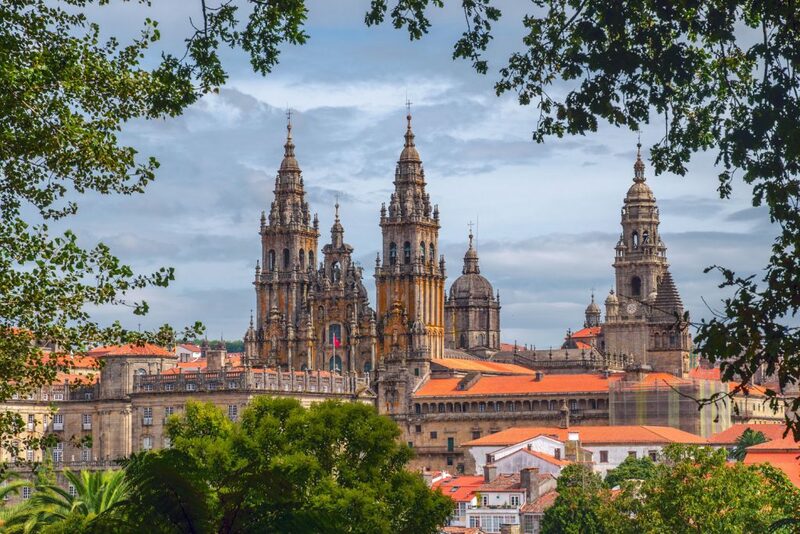 It goes from the delightful town of Sarria, down through the rolling Galician hills to reach Santiago de Compostela, the glorious end point of just about every Camino. Distance: This trip is 117km in total. In order to gain your Compostela (certificate of completion), you have to walk the last 100km of the Camino and this route is so popular because of its perfect distance. Generally you will walk around 23km (14 miles) each day, though we do have an option to split one of the longer days and take it a bit easier. Grade: This trip is graded as Moderate. 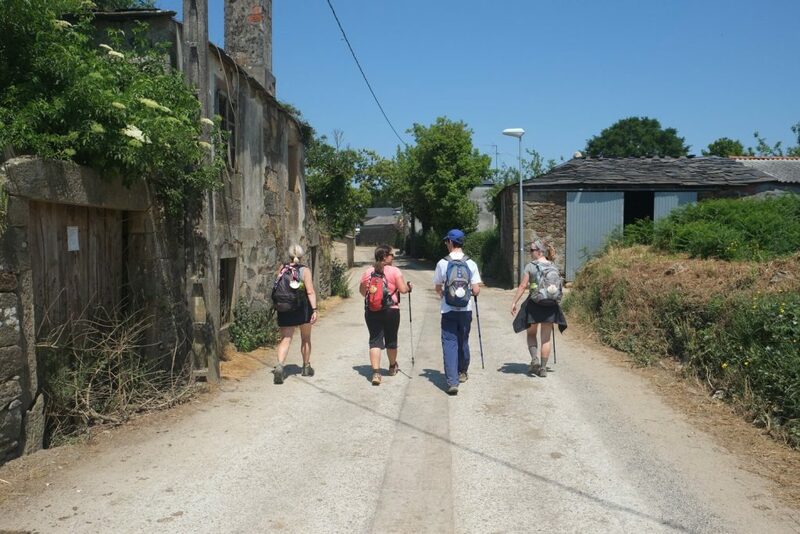 Normally we would recommend having some long distance walking experience before tackling a trip of this grade, but with Sarria to Santiago, a good level of fitness would suffice. There are absolutely no navigational issues on this route, following the yellow arrows and other walkers could not be easier. The paths are in great condition and often wide enough to walk side by side with several others, helping this to be one of the most sociable walks on the planet. The Camino is special, it is spiritual. 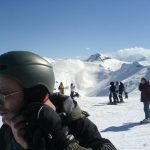 Even coming from a fairly cynical point of view, when I walked it, I felt connected to everyone on the route, felt like I was undertaking something special and that added a lot to the experience. The sheer joy of this route is other people. 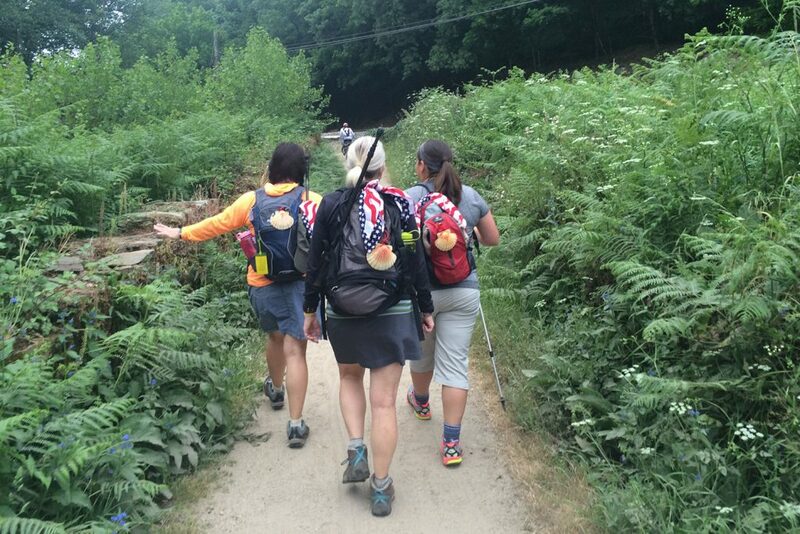 People walk the Camino for all number of different reasons, from overcoming sadness or severe illness, to simply looking for the next step in their life. To walk amongst all these different people and share their stories, to be picked up by them when you are tired and to pick up others when you see them tired is an incredibly special experience. The ‘life-changing’ aspect of walking the Camino comes from this. People from all walks of life, coming together to achieve something positive. It is a deeply inspiring thing to do. Now, so far I have described this great coming together of people to overcome and achieve something, which kind of sounds like they are walking through a long dark tunnel or something like that. Nothing could be further from the truth. The Camino is stunning! Galicia is the lushest, greenest part of Spain (they get a bit more rain here, so remember to pack waterproofs!) The rolling hills, tumble down towards Santiago and you are led through light-dappled forest, along ancient pathways and through the cobbled streets of tiny hamlets. This is a change to explore rural Spain at its finest. The food is exceptional everywhere in Spain and Galicia is no exception. The speciality is Pulpo (octopus) and you can often see them hanging out to dry in the street. While the thought of octopus may not fill many people with joy, I would implore you to try it. The only thing is that it is so delicious here, it might spoil your enjoyment of it anywhere else in the world. There are a myriad of other specialities too and while you can eat cheaply and well with the Pilgrims menu (around €10-15 for 3 courses including wine) we would encourage you to head out and discover what the local towns have on offer. And those towns are generally wonderful. You start your journey in the old town in Sarria. Perched on a hill, its old winding streets make for a delightful way to start your trek to Santiago. Portomarin is a town set on a river and is bursting with verdant green surroundings. The main square is lined with bars and restaurants and can be incredibly lively in the evening. Then there is little Rua, where you stop the night before you head to Santiago. It is little more than a street lined with stone buildings, but has the feel of being right in the middle of rural Spain and it is a wonderful place to stop before you big day. Then, of course, there is Santiago de Compostela. This is a beautiful city, with tight winding streets and wide open plazas. Filled with places of worship and architectural wonder, with the centrepiece being the Cathedral where your journey will end. The tomb of St James lies within and this is the whole point of the early pilgrimages here. The Cathedral and main plaza are a perfect end to your journey and it is here you will see the crowds of strangers who have shared the walk, embracing each other as the lifelong friends they have become. 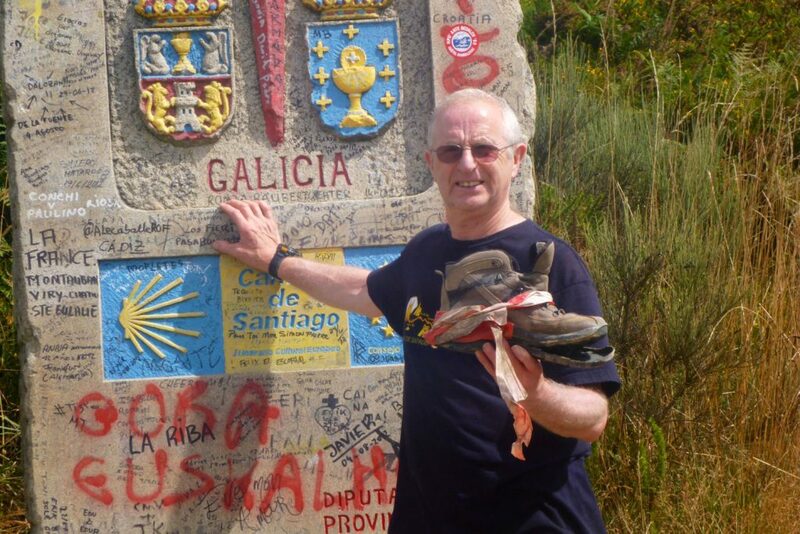 To get on the Final Stage of the Camino we would recommend that you fly in and out of Santiago de Compostela. There are loads of carriers from all over Europe that will fly here. To get to Sarria, we would recommend getting a private transfer if there are a few of you to split the cost, or you can take a local bus to Lugo or jump on a train to Sarria which will takes around 3 hours.